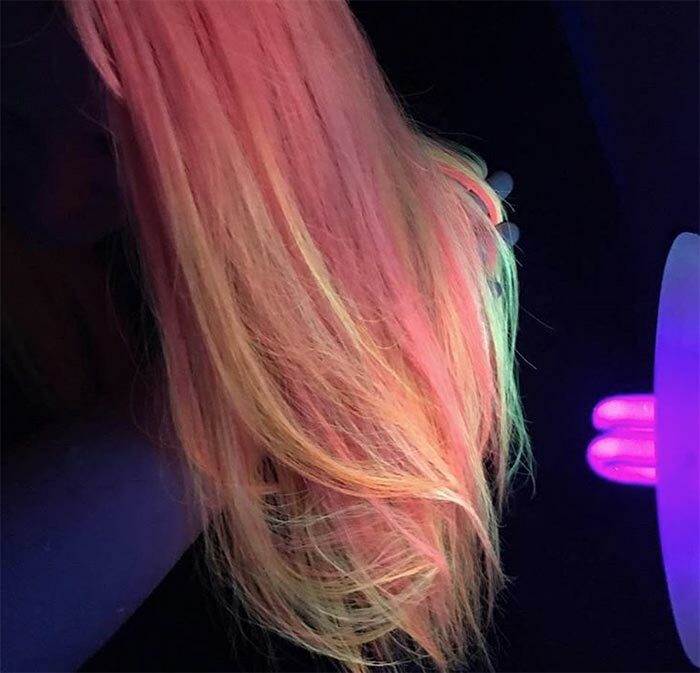 Glowing neon hair is the newest full on trend that no one really knew they needed until they saw it. Once it was seen, it was on the scene everywhere. 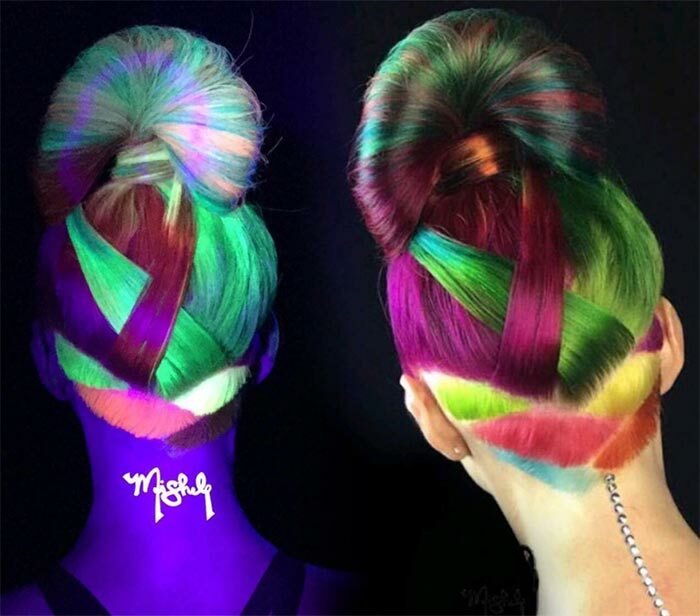 As trends evolve naturally it makes sense for glow-in-the-dark neon hair to be the next big and bold thing as rainbow hair is still on trend as well. 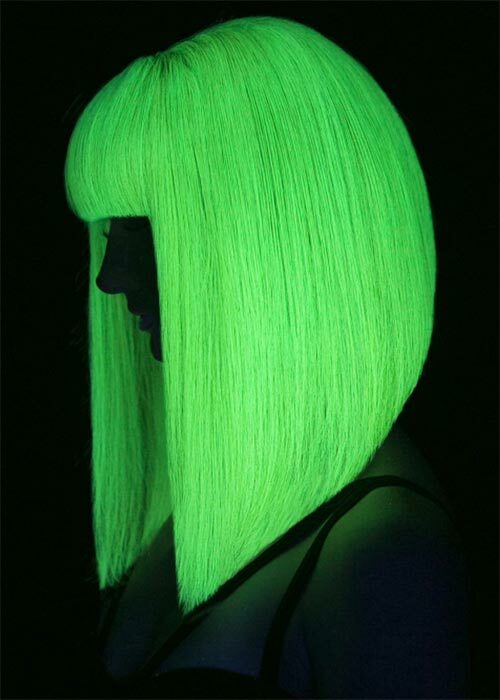 The fun thing about glow-in-the-dark hair is that it can look great in all light. Take a look at Guy Tang’s Instagram. Be careful though, his amazing creativity is an entrancing set of photos and amazing amount of skill. It is easy to lose track of time while looking through his work. 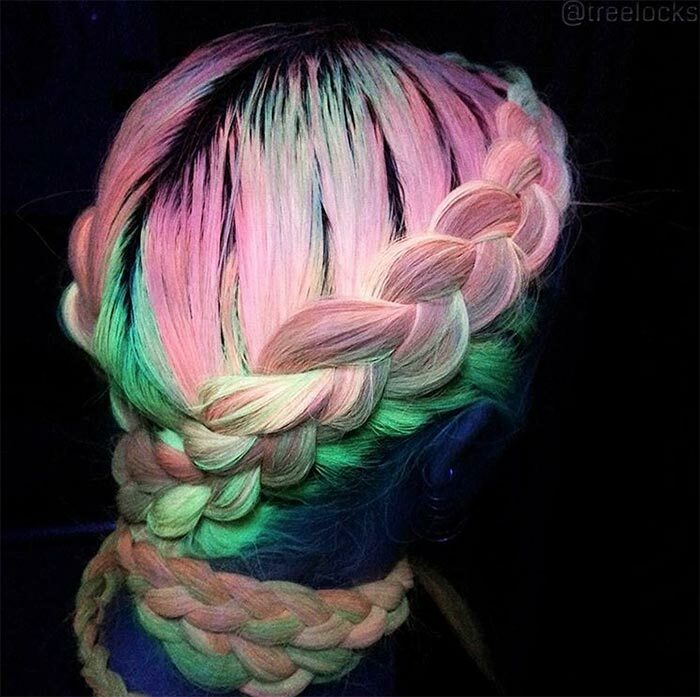 How to Get Glow-in-the-Dark Neon Hair? Guy did a look where his model looked to have very cool, beautifully streaked my little pony bright hair, but when the UV lights came on ” POW ” Las Vegas glowing strands everywhere. 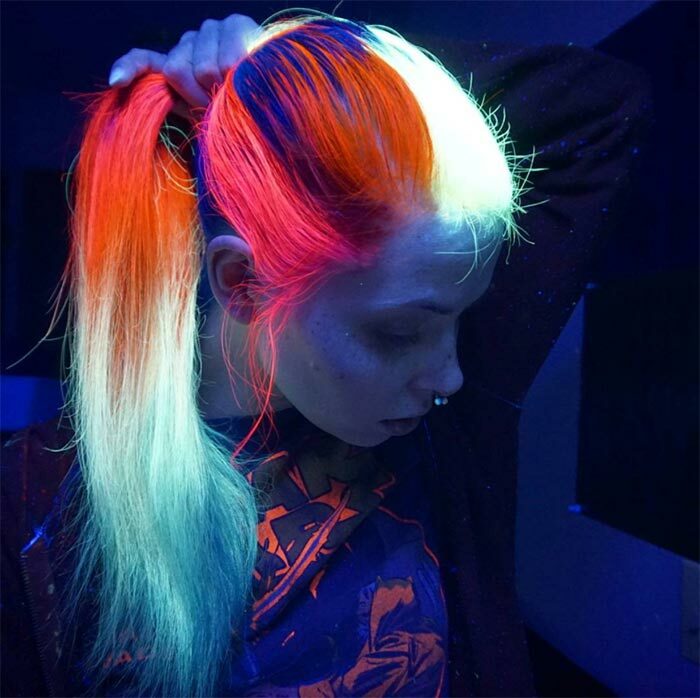 One of the best things about following the beautiful constructions of Guy Tang’s talented mind is his YouTube channel, where he discussed the process to achieve this glowing neon hairstyle, dubbed Phoenix hair for obvious reasons. On his Youtube channel, Guy explained that the color of the model’s hair has to be bleached to light blonde, then the hair dyes from Kenra Professional Creative Neons Colors collection were brushed in. He used Fuchsia, Red, Orange and Yellow in an ombre style to create the glow-in-the-dark Phoenix hair look, each color melding in well to for a lava rainbow hairstyle in normal light. 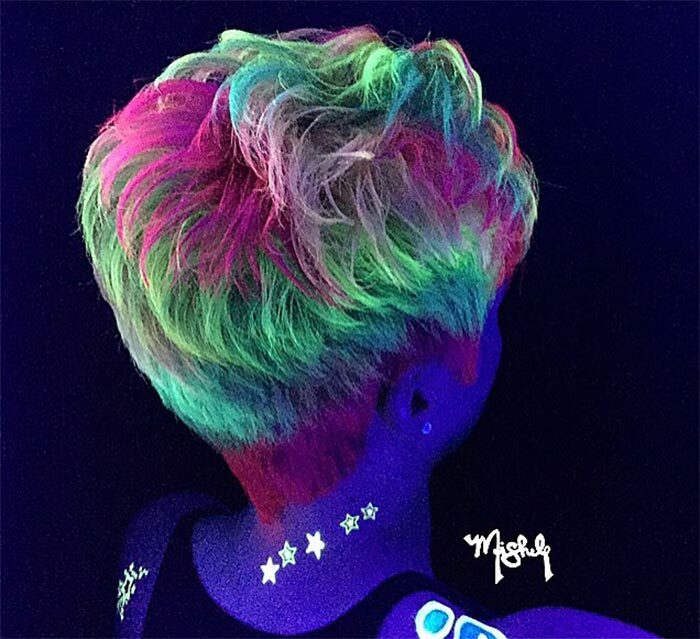 When the model was in the black light, however, her hair exploded into incredibly bright glow-in-the-dark neon hair. She will be ready for any party, any event, hell she will be the most impressive in her black lit spin class before even breaking a sweat. That very look is number 3 on the list below. Go to Instagram and follow the #NeonHairBattle and #NeonMania hashtags to see what other people are doing with this doubly vibrant hair color trend. As stunning as the look is, it is best done with experience as the hair has to be bleached incredibly light for the colors to take full saturation and for the best glowing effect. Bleaching can be technical and difficult to do without causing irreparable damage to hair. 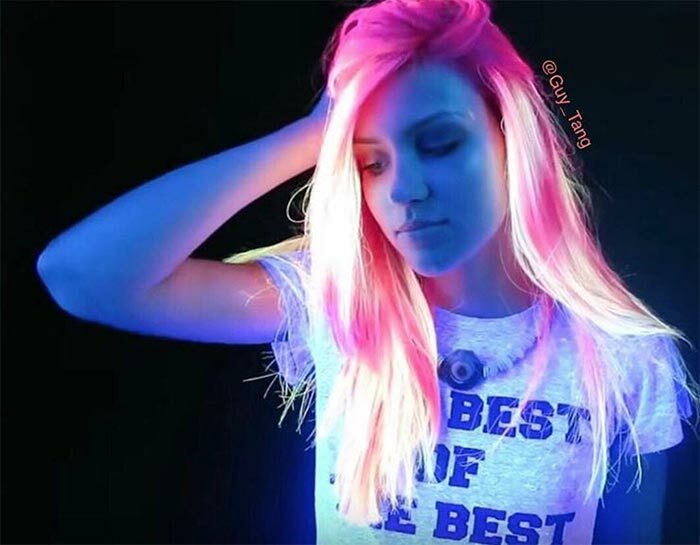 Done well, the glowing neon hair color can be as vibrant as you want during your time in the daylight and even brighter with its neon glow in black light. 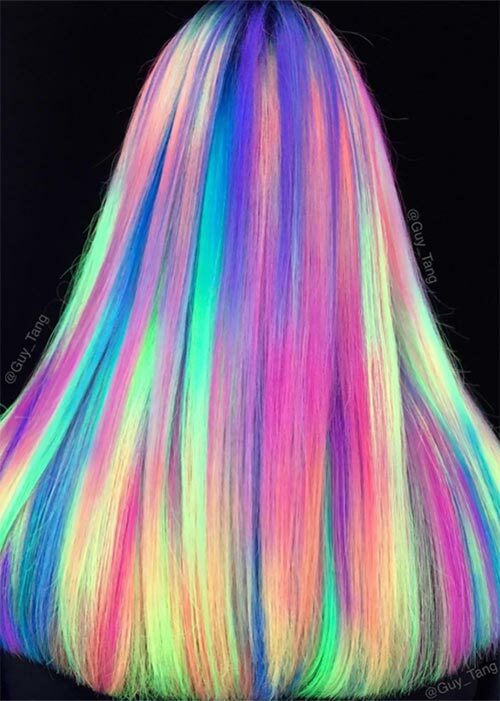 If you are a subtle person and want to try neon, check out a few glow-in-the-dark neon hair color ideas, as there is a lot of ways to go about folding this trend into your personal style. As with all hair colors, maintenance is required to keep it up and in order to keep the glow ever-present, hair has to be healthy and the upkeep has to be regular. If you need a bit of inspiration, take a look at the glow-in-the-dark Phoenix hair colors below. Rainbowmegz is a mega talent; her Instagram is amazing, twisty and interesting. Unsurprisingly, her glowing neon hair is also. 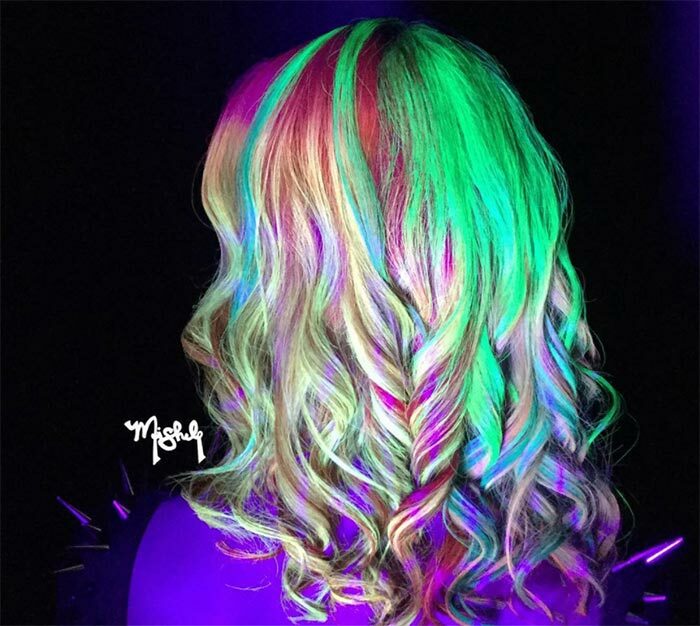 The rainbow hair with a UV mega glow is a great look and the color overall is everything the UV trend is about ” bright vibrant mega glow in the dark hair color. 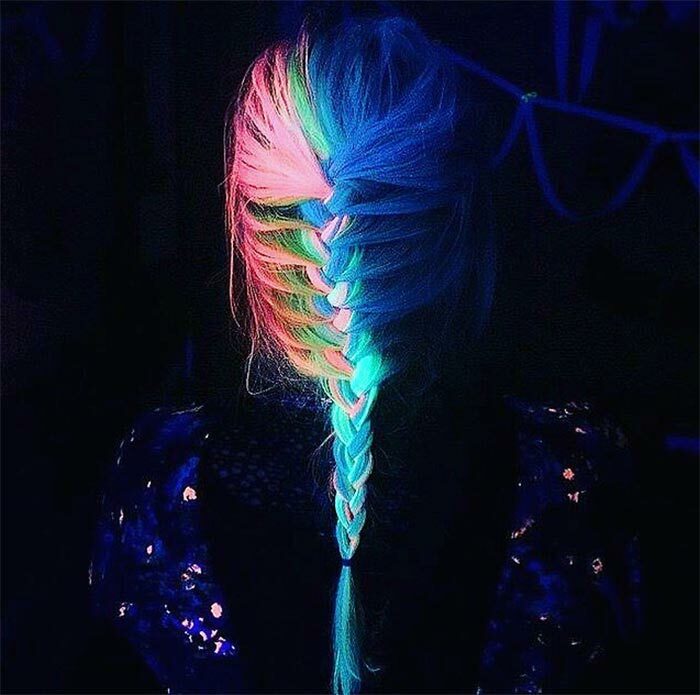 The deeply pigmented neon hair colors go from one type of bright to another once the black light switches on. The shades of pink, tangerine, green and yellow blend together stunningly well for a glow-in-the-dark Phoenix neon hairstyle that is remarkably soft while being simultaneously brilliant. This is the beautiful phoenix look we were introduced to with colors of a bright and deep pink, red, yellow or orange and fuchsia designed beautifully to light up like this. The colors are bright in the day and supernaturally bright at night. Hand painted hair is incredibly nuanced and unique and here we see the effects of a talented hand at work. This style is so beautifully done that it mimics one of the most beloved visions throughout the world. Though it could be blended, why should it be? These streaks are as prominent next to each other as the vibrant UV glow is overall. The black light really does bring out the exciting style of her glowing neon hair, which these colors would look good in either up or down. The sculpted ponytail is amazing enough but the glow-in-the-dark hair color works beautifully well on the undercut design as well. The blending in the ponytail changes to a great UV color blend in the light, but the undercut really stands out. 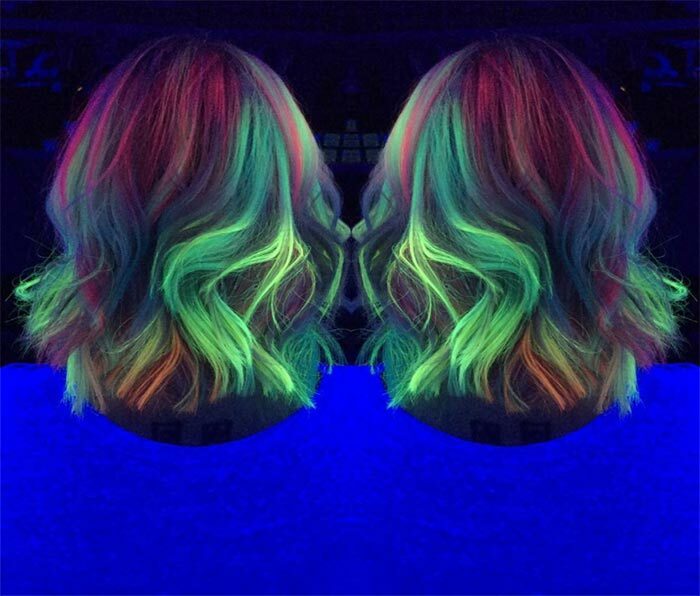 If you want to do bright hair with glowing neon hair color, this is an interesting way to go about it. Every strand is bright and glowing; every curl accentuates the neon as well. While this is surely beautiful in the daylight, it is exceptional in the black light. On a lot of hair color trends, pixie cuts can get the short end of the stick if they are not careful. That doesn’t seem to be the case with glow-in-the-dark neon hair colors, as everything is sure to stand out. 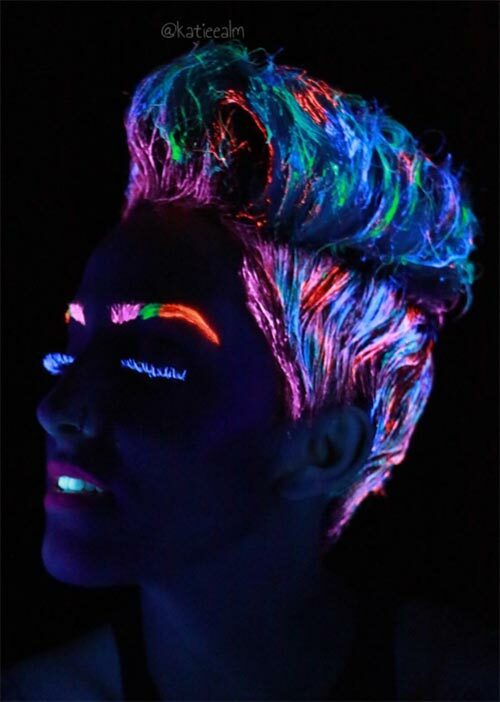 As nice a touch as the similarly treated eyebrows, glow-in-the-dark lashes and lipstick are, they cannot compete with the impressiveness of this pixie haircut treated with glow-in-the-dark neon hair color and beautifully upturned. 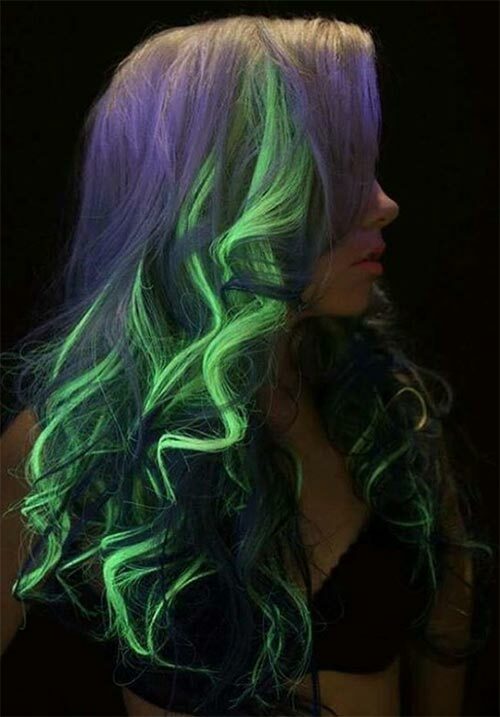 Neon hair has to be well maintained, but if handled properly, the glow can really last. This look is a testament to that as it was dyed to glow in the dark a month prior to this photo. Pinks, yellows and greens flow in and out of the braid brightly for a full on bright Dutch braid. Seeing a glow that is both vibrant and soft in multiple colors is astounding and that is the exact appearance here. 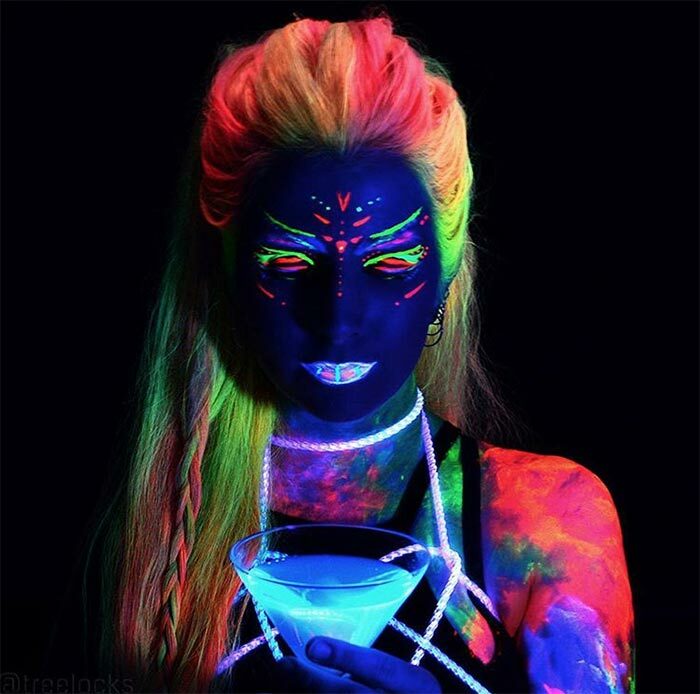 The accent of her glow-in-the-dark hair along with the glowing makeup, jewelry, paint and drink are collaboratively beautiful, but nothing in the photo can truly compete with her neon glowing hair accented with a braid that wraps all of the soft neons into it. I love an asymmetrical bob, especially one with bangs and a beautiful color, but this is next level lovely. The glow reigns supreme over even the cut, which is flawless. I love every inch of this look and I would be hard pressed to find someone who didn’t. The flow, the form and the sheer brightness of this radioactive green are stunning. Soft but still neon, the blues, lavenders and greys work well the brightly lit neon green highlights in her hair. Goths can glow in the dark and this proves one hundred percent that the trend is for moldable to your taste and aesthetic. French braids are cool styles anyway, but everything is clearly elevated to previously unforeseen levels with the use of glow-in-the-dark hair. 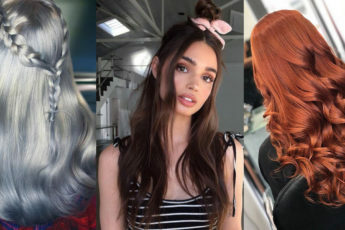 It is no wonder that with something as simple and elegant as a French braid the colors can still be seen just as strongly and just as vibrantly, since neon hair is all about standing out. Working such glowing neon hair colors as violet, green, fuchsia, blue, charcoal, yellow and orange in this textured, wavy bob hairstyle is the coolest idea to make it even more stunning. This looks subtle, but also wild and absolutely sick, so why not embrace this glow-in-the-dark hair trend to stand out from the crowd (literally)?